The response of tumors to anticancer drugs has been observed in real-time 3-D images using technology developed at Purdue University.The new digital holographic imaging system uses a laser and a charged couple device, or CCD, the same microchip used in household digital cameras, to see inside tumor cells. The device also may have applications in drug development and medical imaging. "This is the first time holography has been used to study the effects of a drug on living tissue," said David D. Nolte, the Purdue professor of physics who leads the team. "We have moved beyond achieving a 3-D image to using that image for a direct physiological measure of what the drug is doing inside cancer cells. This provides valuable information about the effects of various doses of the drug and the time it takes each dose to become significantly effective." The laser is gentle and does not harm living tissue, Nolte said. The cancer cells used for the research were grown independently in a bioreactor in the laboratory. Holography uses the full spectrum of information available from light, more than what the human eye can detect, to create a 3-D image called a hologram. By shining a laser on both the object and directly on the CCD chip of the digital camera, the system screens the pattern of light reflected back from the object and allows the camera to record very detailed information, including depth and motion on a scale of microns, or 0.0001 centimeter. The scattered light waves reflected back from the object come together at the camera's detector and form what is called "laser speckle." To the eye, this speckle appears as a random pattern of blotches of bright and dark, but the pattern changes if there is motion within the object. "All living matter is in constant motion, and the laser speckle from a living object is constantly changing with that motion," Nolte said. "This was the key to the diagnostic ability of the technique. The image appears to shimmer with the motion inside the cell. As the anticancer drug works, there is less motion inside the cell and the shimmer effect is reduced. This can be seen right on the screen." The findings of this National Science Foundation funded research was detailed in an oral presentation on Tuesday (March 6) at the American Physical Society Meeting in Denver, Colo. The team was selected from more than 7,000 submissions as one of 25 to present results at a meeting press conference. John Turek, a professor of basic medical sciences at Purdue, and Kwan Jeong, a graduate assistant, collaborated with Nolte on this work. The team detects the motion of organelles inside cancer cells. Organelles are tiny specialized structures that perform internal cell functions and are a common target of anticancer drugs because they play a key role in the uncontrolled cell division that makes cancer lethal. Colchicine, the anticancer drug studied by the group, limits the ability of organelles to travel throughout the cell and perform their functions. The drug disrupts the growth of microtubules, the highways of the internal cellular structure, and leaves organelles stuck at dead ends unable to move. This reduction in motion translates to less shimmer in the image on the screen and can be quantitatively analyzed by a computer program, Nolte said. "Let's say there are 1,000 organelles reflecting light; the exact pattern of the laser speckle is sensitive to each organelle's location," he said. "If one moves even one-half micron, then the pattern changes. It is highly dynamic and sensitive to changes." In addition to the technology's sensitivity to motion, the field of view is unique because of its "dynamic range," the difference between the largest and smallest scale accessed. "We can look at a fairly large section of the object, about a 30-micron-thick section of a 700-micron-thick tumor," Nolte said. "At the same time, we can retrieve information within the micron scale. "Biologists currently have to look at things on the cellular level through microscopes. With this technology, we now can detect things on the cellular level and the tissue scale at the same time. In this case, the whole is greater than the sum of its parts. Tissue is more than just an accumulation of cells. It is a communication network in 3-D that behaves differently than 2-D cell cultures." In addition to realizing the diagnostic applications of the shimmer, the group has simplified and reduced the cost of the system. 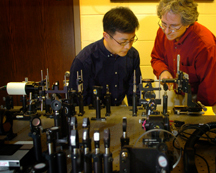 In 2002 Nolte's group was the first to use holography to produce images inside of tissue. The original technique used special semiconductor holographic film developed by the team as opposed to a CCD chip. "At the time, the only way to capture the image was on this very expensive, very difficult to make film," Nolte said. "But the CCD cameras kept getting better and better and reached the point where we could make the transition from holographic film to the CCD." Light waves have peaks and valleys that offer information about depth undetected by the human eye. By shining a second laser directly on the CCD chip, bright and dark fringes occur corresponding to the relationship of these peaks and valleys. These fringes, or interference patterns, can be recorded directly onto the camera. "This extra laser light wave, called the reference wave, acts like a yardstick," Nolte said. "It provides depth information and measurement. It gives us the original image layered with the fringes and the specific locations of these fringes tell us about the 3-D structure of the object." The team combines this holography technique with "laser ranging," a method similar to radar that measures the time it takes for a laser pulse to travel to an object and be reflected back. "The holography gives us the peaks and valleys and detailed depth information, while the laser ranging allows us to control how deep we are looking," he said. The team plans to make measurements of the cytoskeleton, the support structure of cells, and to further examine what types of motion influence the shimmer effect. "What we have seen is just the tip of the iceberg," Nolte said.